Note the inability to explore Folders and it is not possible to drag-and-drop files. All you see is a single folder containing images taken with the 3MP of camera. iPhone has been the 'in thing' for much of 2009 and it must've been such a great pride to own one. It has been the pace setter on many fronts and it still is today albeit few 'iPhone killers' appearing one after another. Why I hate the iPhone? Well, not literlly but that was out of some frustration after using it for sometime. It was rather meant to be 'my wishlist for iPhone' functionality. 1) First and foremost is the iPhone's Storage Connectivity. 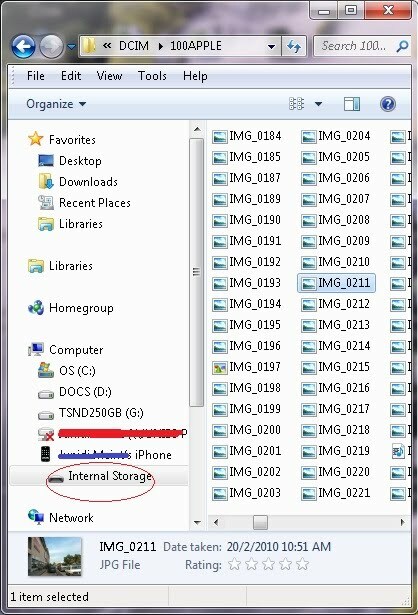 I can't connect my iPhone to my Laptop/PC and drag-and-drop files onto. Unlike my wife's Samsung Omnia which operates on Windows Mobile. 3)Camera is nothing to shout about. The 3MP camera needs more work to improve. It is too slugish and lagging behind in today's competition. I have a dedicated Compact Camera and DSLR, so i'm not too concerned about the phone cam. But what about storage connectivity? This alone left me wishing for something other than an iPhone. So, dear iPhone, on your next upgrade please open up a bit to the outside world and be friendly to others.